Portability, functionality and power combine to form a job-site table saw from JET that stacks up to the heartiest of stationary saws. A collapsible, heavy-duty wheeled stand supports this 10 in. table saw with the same balance and steadiness youd expect in a shop setting while the 15 amp motor gradually ramps up to 4000 max RPM. Unfurl the extension wing to expand right-ripping capacity to an ample 25 in. and rely on the anti-kickback riving knife and transparent blade guards for safe operation. 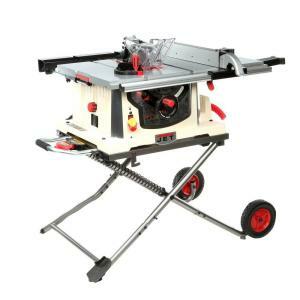 Tbook.com crawls the web to find the best prices and availability on Table Saws and related Tools and Hardware products like JET 15 Amp 10 inch Professional Jobsite Table Saw with Rolling Stand, 115-Volt, JBTS-10MJS. For this page, related items include products we find that match the following keywords: "Table Saw" at our vendor partner Home Depot. JET 15 Amp 10 inch Professional Jobsite Table Saw with Rolling Stand, 115-Volt, JBTS-10MJS is one of 60 Table Saws and related products listed in the Tools and Hardware section of Tbook.com If you have any questions on this product, please give us a call at 734-971-1210 during the hours of 9am - 5pm EST for assistance. Thank you for shopping at Tbook.com, the Internet Department Store!